Gmail’s iOS app is such a reliable email client that it’s crazy to think it hasn’t been drastically updated in four years. Well, Google has decided that it’s time. On Monday, Google released an updated version of Gmail’s iOS app that includes a faster search engine, swipeable actions, and Undo Send. 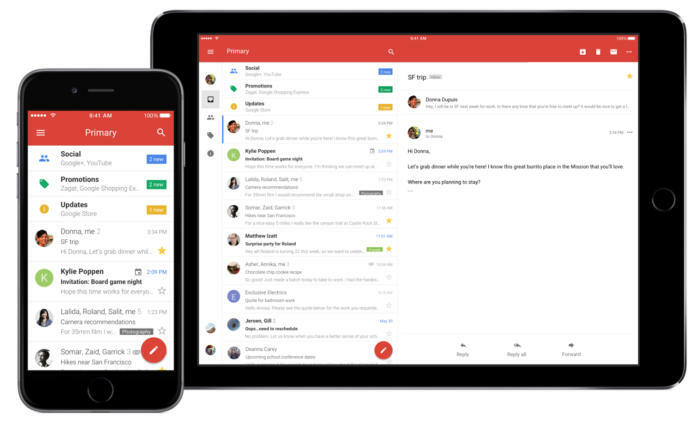 It’s been almost four years since Gmail for iOS has seen an overhaul that’s as feature-packed. In addition, Gmail also got a visual refresh to look less cluttered while incorporating photos of your contacts. In terms of both functionality and user experience, Gmail for iOS seems to be replicating Inbox, Google’s other mobile email app. The most anticipated feature now available on Gmail for iOS is Undo Send, Google’s pioneering email functionality that gives you a few seconds to reconsider whether you really meant to hit Send. Originally only available on the desktop, this feature has proven extremely helpful in preventing all types of user errors, from embarrassing typos to realizing that you send an inappropriate email to your boss. 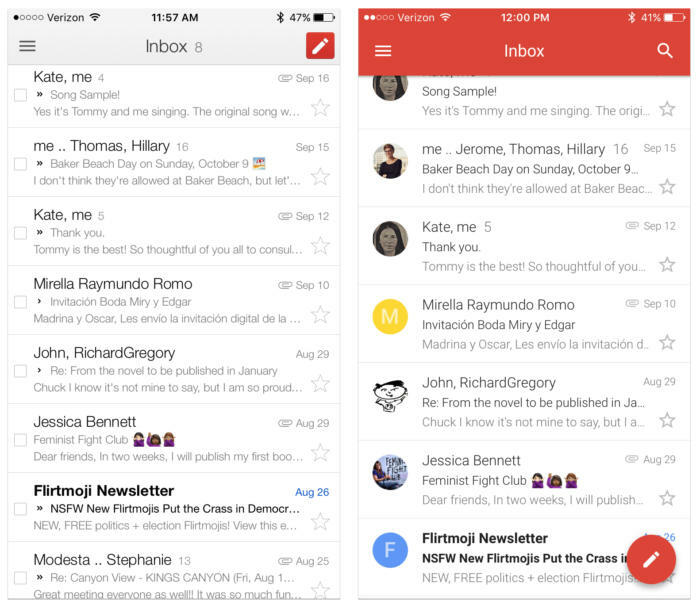 Gmail for iOS, before and after. In the new Gmail app, Undo Send surfaces as a call-to-action bar at the bottom of the screen right after you hit send. It’s very similar to how you can undo actions like deleting or archiving a message. Undo Send is already integrated into Inbox by Gmail. Another feature that Gmail’s main iOS app has borrowed from Inbox is swipeable actions. Now, you can swipe left or right on any message thread to delete it or archive it, and you can select which removal option you prefer in your settings. However, swiping either way will perform the same action (delete or archive), and you can’t customize them individually, for example, setting swiping-left to archive and swiping-right to delete. Swipe-able actions have become an integral part of mobile email, so it’s disappointing to see Gmail embrace the feature in such an elementary way. Outlook, CloudMagic, and even Apple Mail have incorporated more robust swipeable actions so that you can go through your inbox more efficiently. Hopefully in a future version, we’ll see Gmail for iOS bring more customization to swipeable actions, such as swipe-left to archive and swipe-right to move to a folder, mark as read, or flag. Lastly, Gmail for iOS has an improved built-in search engine, so you’ll now get instant results as you type. The app has also incorporated smart suggestions based on your Gmail search history, both on the iOS app and on the desktop. Plus, search can spot minor typos and offer a better “did-you-mean” suggestion. 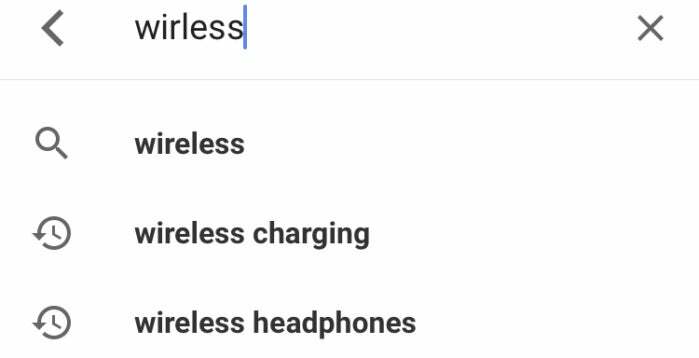 For example, I searched for “wirless” and Gmail suggested results for “wireless.” It also suggested “wireless headphones” and “wireless charging,” phrases that I had previously searched for in Gmail on my desktop. Syncing search phrases to offer the best suggestion regardless of where you access Gmail proved to be a useful surprise. 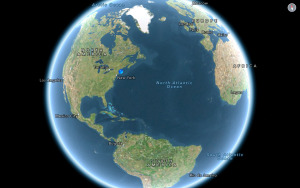 Gmail is not the only iOS app that Google updated on Monday. 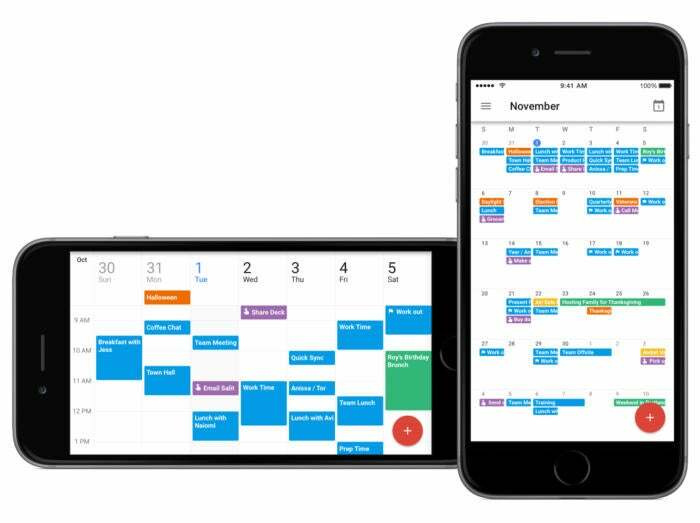 Google Calendar for iOS now includes support for weekly landscape view, Spotlight search, and alternate calendars. Searching for events and reminders in Spotlight will now surface relevant results from Google Calendar. In addition, you can now use Google Calendar to view dates in the Lunar, Islamic, or Hindu calendars. For years, Gmail has been a highly-recommended email app for Google users. And this latest overhaul will certainly make it more of a must-have if Gmail is your primary email account. The Inbox-inspired upgrades also suggest that Google might be moving closer to having a unified iOS email experience. The only real downside to Gmail for iOS is that it only supports a Google email accounts, as does Inbox. So, if you like to use just one app to sort through different email accounts, you may be better served by Outlook, CloudMagic, or these other options—at least until Gmail gives iOS users the same features that are typically reserved for its Android counterpart.